This week he visited an orthopaedic surgeon, who has diagnosed Quentin with a grade 2 luxating patella in both back legs. Basically, his kneecaps are dislocating themselves, which is causing him to raise one of his legs until the kneecap slips back into position when he extends his leg again. He ends up walking on three legs for anything from a few seconds to a couple of minutes, sometimes several times a day. Quentin will need two operations, about six weeks or so apart - one on each of his back legs. The surgeon will create a deeper groove in the bone which will hold the kneecap in position for him. He will - sadly - be withdrawn from the Guide Dogs training programme, mainly because of the time it will take for the operations and recovery, but also because he will be more prone to arthritis in his later years and guide dogs are required to walk mostly on hard surfaces. His parents will be withdrawn as breeding stock, because luxating patella is a hereditary condition. Guide Dogs will be paying for the operations and helping support his recovery within their training centre. I'm really impressed with and touched by their level of commitment to the welfare of a pup who won't ever be a guide dog. And - this part is the silver lining in the cloud - we have decided to keep him as a pet. I'm very happy about that part! 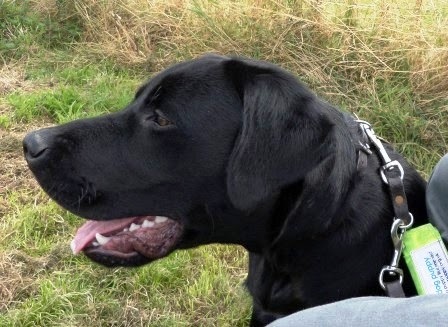 I'm really quite sad that he won't be a guide dog, because he is showing signs of being a fabulous guide! He knows exactly when the road is safe to cross - he often starts to make a move before I tell him to. He has safely guided me around parked cars, too. Having a mind of his own means he does sometimes try and make a decision based on where he wants to go (grassy areas are definitely desirable!) rather than where I want to go! 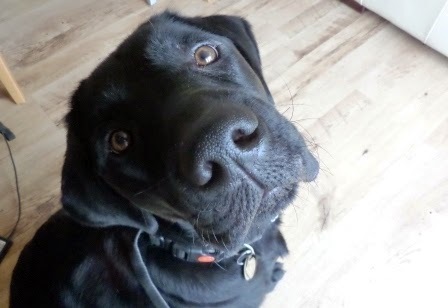 But my sadness at him not being a guide dog is balanced with the knowledge that I can continue to enjoy his company and watch him develop into a happy pet dog. 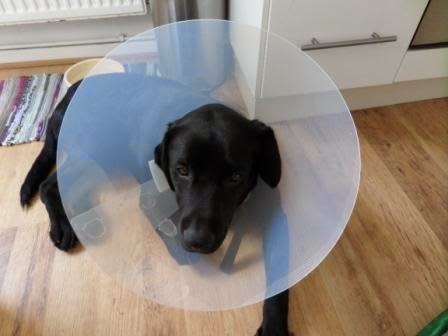 Fortunately, he didn't mind it at all last time, although he took chunks out of it from walking (and running) into walls with it on! I'm linking up to Handmade Monday in its new home today. I apologise to all the Handmade Mondayers for the distinct lack of handmade in this post! I know there are some of you who have been waiting to hear about Quentin, so hopefully you will forgive me! its so nice you are going to keep him as a pet, surely he will be happy about it. Bless him! I was hoping we would get an update. Your posts about him were favourites of mine and I'm so glad that he can be your pet even though he can't be a guide dog. oh bless him, its sad that he won't be a guide dog but great that you can keep him with you. It's amazing how much the guide dog association is prepared to look after him too. Fingers crossed his ops go well - I'm so pleased you are going to keep him , it would have been very difficult to let him go. Quentin is such a lovely dog, you will have lots of happy years ahead together. Sorry he has this leg problem tho and no longer able to be a guide dog. Aww poor Quentin. Hope operations go well abd so pleased you have decided to give him a furever home. Lucky Quentin...lucky you. It was meant to be! Oh, bless his little heart! At least you know what the problem is and what can be done to help him. It's lovely to have an update, thanks. Well I guess that that really is a silver lining that you will get to keep him forever. The thought of having to give him up must have been really hard, especially after all you have been through. Wishing him luck for the op. Ah it's sad but happy too as you and Quentin won't have to be parted now which would have been sad for both of you. Hope he is ok - he goes to hospital same day as me so I will be thinking of him!, I have bad leg too with this sciatica! Thanks for the Update! I think it's safe to say that EVERYONE who reads your blog has pretty much "adopted" Quentin in spirit! And to be honest, what's going on probably is for the best as I really couldn't see you easily parting with him had he been "healthy"! I also doubt that he would have taken well to being separated from you! GOOD LUCK to you both and give him big *HUG* for all of us! Poor little guy but good news for you! He has a lot of people who love and care for him so he's very lucky. And you are lucky to be able to keep him. Blessings on all of you! Sorry that Quentin has to go through the wars and that he won't be a guide dog, but it's lovely that he gets to stay with you! It is so nice to hear from you and get an update on Quentin. Although it's bittersweet, you are both lucky in that Quentin will have a forever home and you will have a loving dog to be by your side. I wish him a speedy recovery with his upcoming surgeries.